We developed the Young Masters workout to keep children challenged and develop their knowledge of swimming. Our Young Masters workout has been modeled on our Adult Masters group. In this way, we can maintain teaching consistency across our classes and levels. Our Adult Masters group offers free practice sessions for lifelong fitness, no matter your level of ability. Contact us today to learn more about our AM group. The YM workout is for swimmers who have shown proficiency in our LTS program and/or know the four basic strokes. YM is ideal for swimmers who only swim during the summer league season. This group works in a similar way to our AM swimming groups. YM practices take place in a 25-meter pool and have the same qualities of a competitive workout minus the required level of commitment. Our goal is to gently introduce young swimmers to competitive swimming. Swimmers who either don’t know if they want to swim competitively or who do want to swim competitively but feel intimidated by swimming on a swim team in the traditional sense (meets, frequent workouts, high level of commitment) will benefit from this group. Young Masters takes place in a team-simulated atmosphere with a focus on fine-tuning students’ strokes relative to competitive swimming. Our workouts take longer in order to improve our swimmers’ stamina. Currently, these one-hour workouts take place weekly, on Tuesdays at Deanwood, and on Wednesdays and Saturdays at Chinquapin. 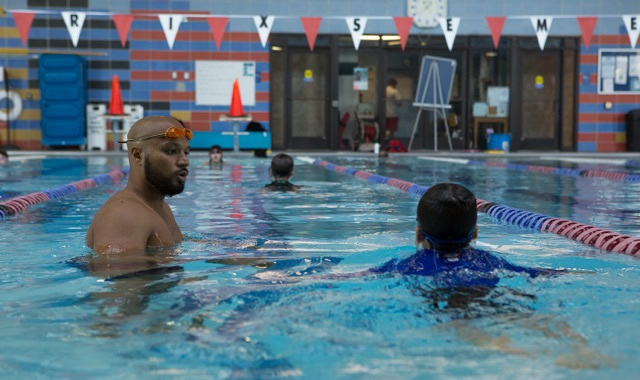 There are two coaches either on deck or in the water to accommodate swimmers of different levels and keep everyone appropriately challenged and progressing. Swimmers interested in this group need to be cleared prior to joining. Clearance will require a swimming test to make sure that each swimmer has the basic skills and conditioning necessary for lap swimming. This is in order to maintain a minimum ability standard for the group. It’s not necessary to master all strokes, as long as a swimmer is at least familiar with them.